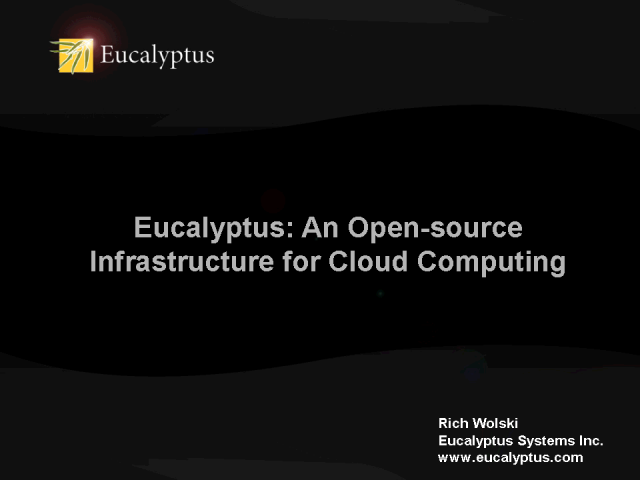 We will present Eucalyptus -- Elastic Utility Computing Architecture for Linking Your Programs to Useful Systems -- an open source software infrastructure that implements IaaS-style cloud computing. The goal of Eucalyptus is to allow sites with existing clusters and server infrastructure to host an elastic computing service that is interface-compatible with Amazon's AWS, but can also support multiple interfaces such as Google's AppEngine. The talk will focus on specific features of the system that are designed to enable rapid development, prototyping, and deployment of local computing clouds, particularly for debugging and/or application development purposes. It will also discuss experiences with hosting the Eucalyptus Public Cloud (EPC) as a free public cloud platform for experimental use and the ability to use the EPC in conjunction with commercial web development services that target AWS, such as RightScale. Finally, we will discuss our experiences in building and supporting open source cloud infrastructure and point to potential future directions that we believe will enable greater innovation. Rich Wolski, CTO, Eucalyptus Systems, Inc. Presented by: Rich Wolski, CTO, Eucalyptus Systems, Inc.